where secret is the SNMP community name, 1 is the version of SNMP, 192.168.1.10 is the IP address of the ENVIROMUX-MINI, and 1.3.6.1.4.1.3699.1.1.3.1.2.1.0 is the indexed OID of the temperature probe. You can see the hierarchy in this screenshot of the iReasoning MIB Browser with the ENVIROMUX-MINI MIB file loaded. Thanks to user fletch, you can download the templates as a .zip file here. Import all four templates using the Import Templates link in the Cacti console. 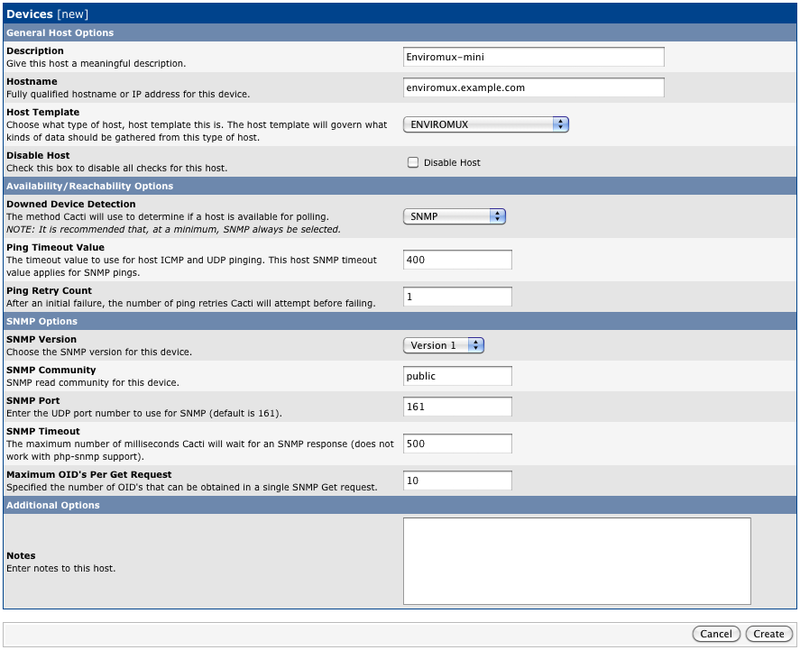 Select the Data Template named ENVIROMUX - Temperature and click Create. Click on Create Graphs for this Host. It will ask you to select a Graph Template. Choose the ENVIROMUX - Environment graph template. 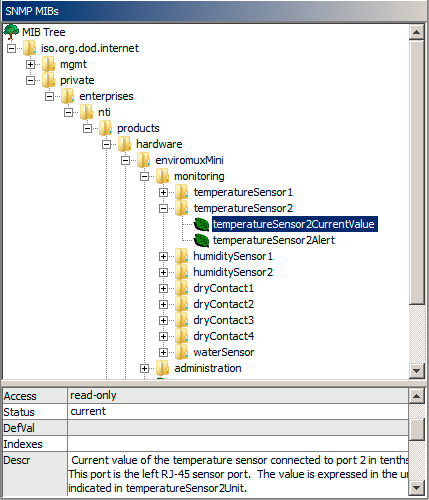 When you do this, it will list the OID for both the temperature and humidity probes. I only have the temperature probe on my unit, but adding both here is not a problem -- they can be removed in the graph template later. To make this change persist, click Save at the bottom of the page. Here's the resulting graph. Yes, it's hot in the server room. The air handlers are offline at the moment and we're watching things closely. Also, I'm wearing shorts in the office in February. Permalink Submitted by anonymous (not verified) on Sun, 2012-04-22 17:39. Looks like it changed again. Permalink Submitted by Justin (not verified) on Thu, 2012-07-19 10:03. Permalink Submitted by John on Mon, 2012-10-15 09:49. Note that the temperature probe will give temperature values that are 10x more than the actual value. For example, 70.5°F is given as 705. If, in your Data Template you have the Data Source Item Maximum Value set to something like 100, you're going to get -nan in your graph because the value being returned is 705 which exceeds your max. So you'll want to set the max to something like 1100. In the above example, enviromux_temperature_173.rrd is the name of my RRD; yours will differ.